I imagine my story is pretty common, even for a fitness professional. There are low points in life when we all “lose it” and I did just that a few years back. I lost it. I was feeling just awful about myself and not sure if I could do anything about it at 45. Menopause hit me pretty hard! I felt miserable in my own body, I started slacking off my own workouts, and slowly became heavier and sadder. To make a long story short, I pulled myself out of that hole and then went on to compete as a Masters Figure Athlete despite my age so I know that it’s possible. This is my story. I didn’t set out to compete, I just wanted to get back into shape and feel good about myself. I was able to do just that within 6 weeks of focusing on my goal. In a very short time I reached a “comfortable for me” weight, I fit into my clothing nicely and I felt happy, energetic, healthy! I was good with my accomplishments right at this point, 2 months into training, but I “got bit” by the competition bug. I was curious to see what more I could accomplish and I was eager for a stage experience. I made the commitment! But that came a later, let me go back to the beginning…. Even in the very beginning, I thought I was in good shape. I went to sessions 3 times per week, and it was hard, and not really because it was hard but more because it was different. I’d never, in all my spandex/leg warmer days, trained like this. Little did I know then that the training would always be hard, more so because my goal changed when I decided to compete. The last pounds are truly the most stubborn to lose! The next few months of training would prove to be challenging. The closer I got, the harder I had to work to get to the low bodyfat levels necessary to compete successfully. I painfully remember the effort of moving the extra 30 pounds I carried. Overweight and Out of Shape. My First Weeks. I kept at it. In those first few weeks I started to feel myself getting stronger. I began to see changes in one month. I learned that effort in the gym was key to fat loss, so I added another session per week. And then another. Very soon I was doing 7 days and loved it. Then, when I started to pay close attention to diet I could withstand better workouts and methodically and gradually, my body utilized it’s stored fat. The progress and results still amaze me. That’s when I made the decision to compete. And that’s when bigger doubt set in. In the weeks of training for a competition you experience doubt. Will my bloated belly turn into chiseled abs? Will my skin tighten up after the fat is lost? Will my thighs lean out? Can I walk on a stage in front of judges and audience? Who the hell do I think I am, at this age, expecting outrageous results? Counting down week by week: 10 out, 9 out, 8 out. As the exercise intensity increased and food intake decreased the self doubt became overwhelming. It was crazy but exhilarating. It was a once in a lifetime opportunity to go beyond mental blocks, physical blocks and grasp exactly what the body is capable of. I’ve never learned so much, personally and professionally, in such a short time. It was a university education! Metabolic Conditioning, High Intensity Interval Training, Circuits, Sprints, Moderate Intensity Cardio: Fat Loss Training requires a variety of work to keep the body from adapting. Whether your intention is to compete or not, it’s important to gradually and progressively overload the system with multi-muscle, multi-joint exercises using resistance. Using the Olympic Bars, medicine balls, dumbbells, and bodyweight allows the body to maintain its muscle mass. The high intensity intervals forces the body’s cardiovascular system to reach the fat stores, and a solid nutrition plan provides the fuel to do both. With hex bars, with dumbbells, with a medicine ball. Jump squats, frog jumps, spy squats….the basic squat movement and all variations are important to shed fat and shape legs. I did a lot of squats! Glute and leg muscles are big and use a lot of calories, so keep doing your squats. The formula to get lean is simple, but the work is hard. Once you understand this and get your head around it you’ll find success. Using bodyweight exercises like the mountain climber, pushup, jump squat as well as multi-muscle squat-rows with cables ensures a consistent increase the intensity and variety of fat burning activity – and you never get bored. We had some good times along the way too, using the bodyweight resistance of coach Terry Stokes. Fun! Training this way is challenging. 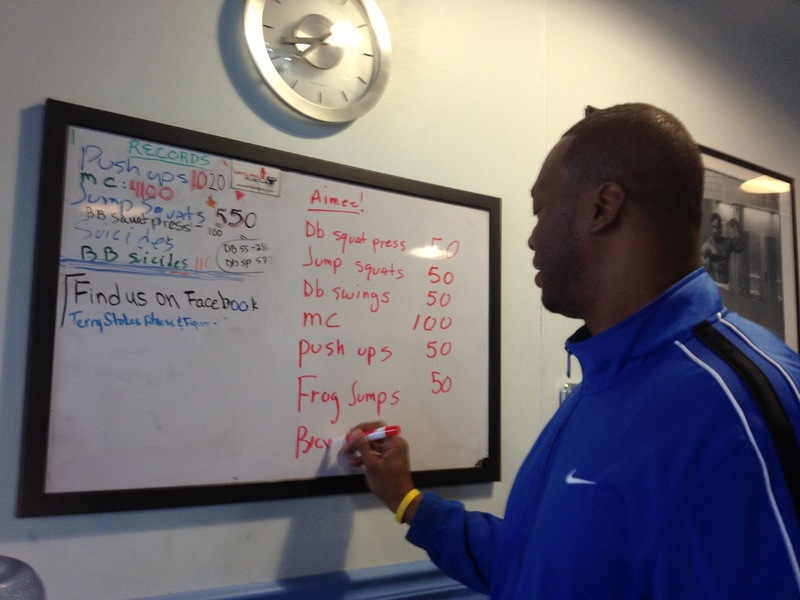 The boards are always tough to do when you begin the workout. Getting through them methodically and with a positive mindset always works, and staying focused on one exercise at a time makes the task manageable. When you finish, it’s an amazing feeling! Flipping tires, pushing sleds, chin ups at the school yard, battle ropes – it’s not so important what workout you choose to do. Strive for variety and work at your current maximum effort and intensity – you’ll get results. Over the next several years I competed in more shows than I can count and earned 24 awards. I placed 1st in the Open Class in a later show and it was thrilling because “open class” means all ages and experience levels. For this “almost 50 year old” it was an incredible experience and a very fun day. Nor am I suggesting this is the only way to achieve your weight loss goals. I’m recounting my journey simply to offer assurance that you too can accomplish whatever you can imagine and work for. If an extraordinary physique transformation Over 40 is what you want you can. Define your extraordinary and go for it! But that is only for competition! It’s not for life! The appearance and physique of a figure competitor is not particularly appealing for everyday life, nor is it sustainable. But it is possible. Throughout all the training and dieting I was strong and healthy. Aside from a few mood swings, (which we all have, diet or no diet!) I felt fantastic, strong, vibrant and healthy. I fully enjoyed the whole experience, from learning new methods of training to experiencing the effects of food on the body. I made great new friends and I reached beyond my limitations and capabilities. Competition was one of the greatest times of my life. I documented all my training in The Action Plan. If you’re ready to start your own journey visit http://www.getfitover40.tv to find out more!